The monastery at Clonmacnoise was founded in 544 by St Ciarán, from Rathcroghan, Co. Roscommon. 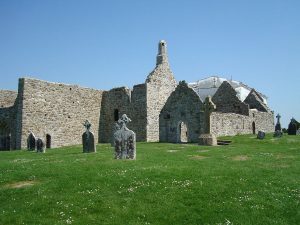 A special summer school on the history of the early Irish monks takes place at Clonmacnoise in Co. Offaly this weekend. The summer school event is being held in the Cluain Ciaráin Prayer Centre on the Athlone Road in the village of Clonmacnoise on Saturday 9 September. The programme for the day includes a number of talks and events. It commences this morning with ‘The Bogs of Clonmacnoise: A Drama in Three Acts’ delivered by Professor Emeritus John Feehan, a geologist, ecologist, author and broadcaster. There will then be a walk and talk by Dr John Feehan and a break for tea and coffee. At noon, Dr Cathy Swift will deliver a talk on ‘Brehon Lawyers, Churchmen and the people of Clonmacnoise’. After lunch, the event will be addressed by Dr Alf Monaghan, who worked as advisor to governments and agencies over ten years in Syria, Turkey, Lebanon and Egypt. Dr Monaghan is deeply interested in the influence of the Eastern Mediterranean on Irish Christianity, and his talk is entitled ‘How the Cross Became Christian, then Irish’. The final talk of the day will be given by Professor Jean Michel Picard of the UCD School of Languages and Cultures. He will discuss ‘Early Irish monks in the settlement strategy of Merovingian Rulers’. The monastery at Clonmacnoise was founded in 544 by St Ciarán, from Rathcroghan, Co. Roscommon. The strategic location of the monastery helped it become a major centre of religion, learning, craftsmanship and trade by the 9th century, and together with Clonard it was the most famous in Ireland, visited by scholars from all over Europe. From the 9th until the 11th century it was allied with the Kings of Meath. Many of the High Kings of Tara and Connacht were buried here. These days, the site stands as a preserved ruin under the management of the Office of Public Works (OPW). An interpretive centre and facilities for visitors have been built around the site, which is open to the public for a fee. The graveyard surrounding the site continues to be in use, and religious services are held regularly on the site in a modern chapel.